FINALLY, MANICURES CAN LAST A WEEK ON ME!!! So yeah, I think that says it all. I'm usually hesitant about doing my nails because whenever I apply nail polish, I can expect it to be all chipped off in less than two days. Blame it on my nails, I'm guessing all these years that it's too oily or acidic or something (I've never had nail polish last on me for more than 4 days without a chip-off), and also to the fact that I lead a very chore-filled lifestyle. I'm always washing dishes, cleaning the toilet, tidying things up, and basically doing all sorts of chores that aren't good for preserving manicures. I always skip my nails on normal days because I'm like "What's the use of doing this if I have to re-do this again in less than three days?" But well, something changed that. And that's gel. I've long heard of gel manicures, but I never got to try it because it's a salon thing. I'm too busy to make it to salons, which is why it merely became an awareness that it exists and nothing else. Until we went to Korea. 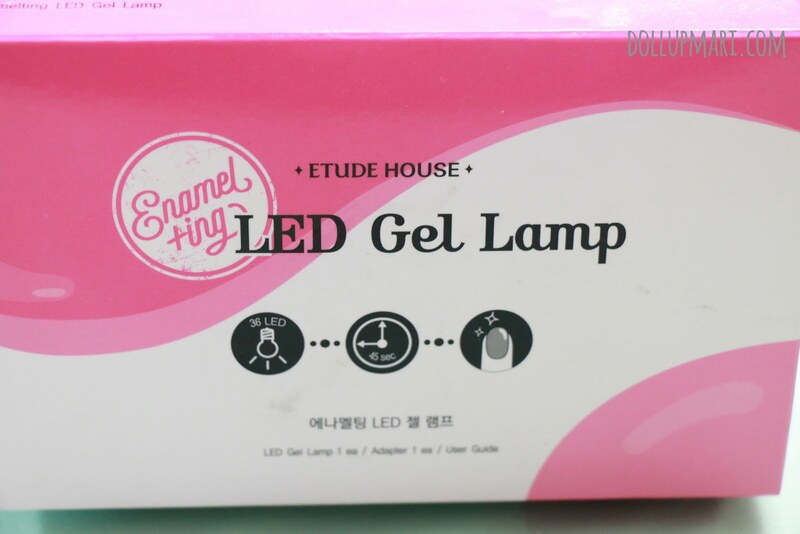 I think you saw my Myeongdong shopping post wherein I talked about my visit to Etude House. 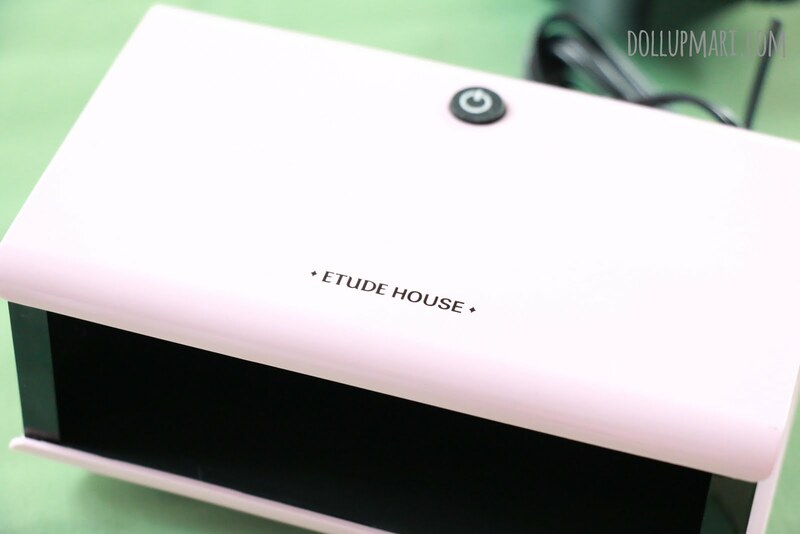 While we were there, I told my mom that maybe she could try the new gel line of nail polishes from Etude. I initially thought that the product line simply mimics gel, but is air dry. Until the saleslady explained to me that a lamp was necessary to cure the polish because I could go on and live my life but the polish would still be wet. At the time, the lamps were at 50% off from 60000 won to 30000 won (about Php1340), and since the price was too good, we bought the lamp. 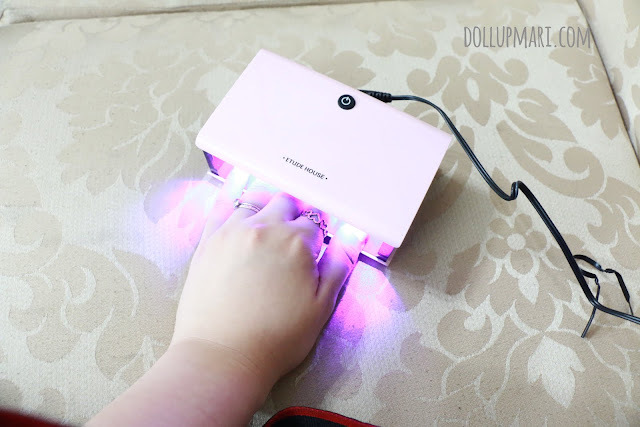 The lamp looks like a kid's beauty playtime apparatus, but it's actually a legit LED lamp. And yeah, since this is a first in my life, I topped it off with another first by having my manicure done by someone else. 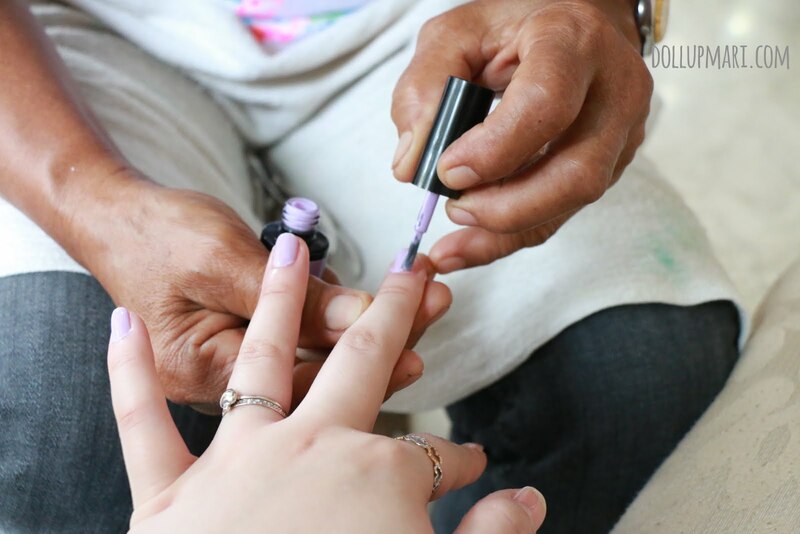 This is Norma, our village manicurist, who didn't want to appear with her face hahaha. 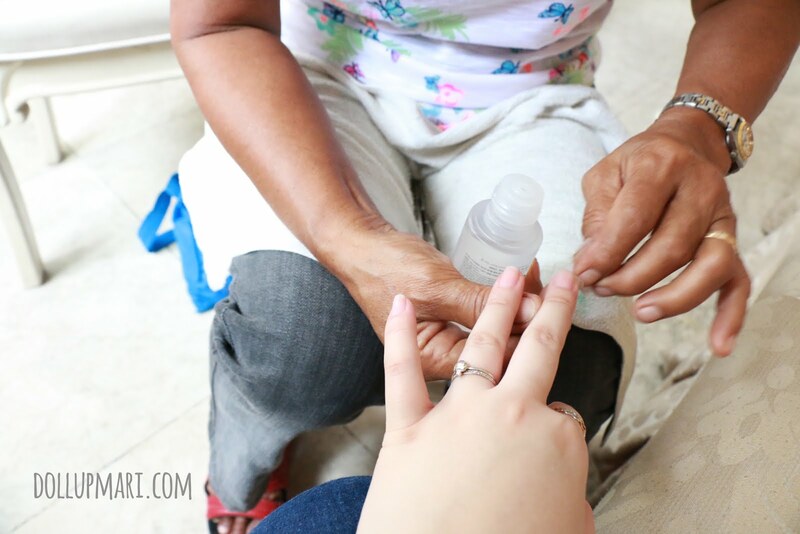 This is me having the nail cleanser applied onto my nails. The first thing I have is the base gel. It cannot be interchanged with the top gel because it's sticky to the touch after curing. I think it's purposely sticky so that the other layers will stick well. The light is a nice purple, and thankfully since this isn't a UV lamp, as far as I know, I don't need to apply sunscreen when using this lamp. This is the color polish now (this is shade 8). It's a nice pastel purple color with bluish undertones. I get everything cured under the lamp. After curing, this is the final effect. Yipee! In real life it feels like as if someone put fake nails on me because the polish is so shiny, and it's got a different texture to it. It's not like nail polish at all, it feels like a scratchproof layer of plastic was placed onto my nails. I love how I was able to do so many chores immediately after getting my nails done without any scratch or accidental peel offs. I love the feature of the system that once it's done curing in the lamp, it's finally done. It's not like the usual polish that it may be dry to the touch, but collectively the layers underneath it are still drying. This is why you don't get those accidental moments of scratching your nail polish off right after you do it. 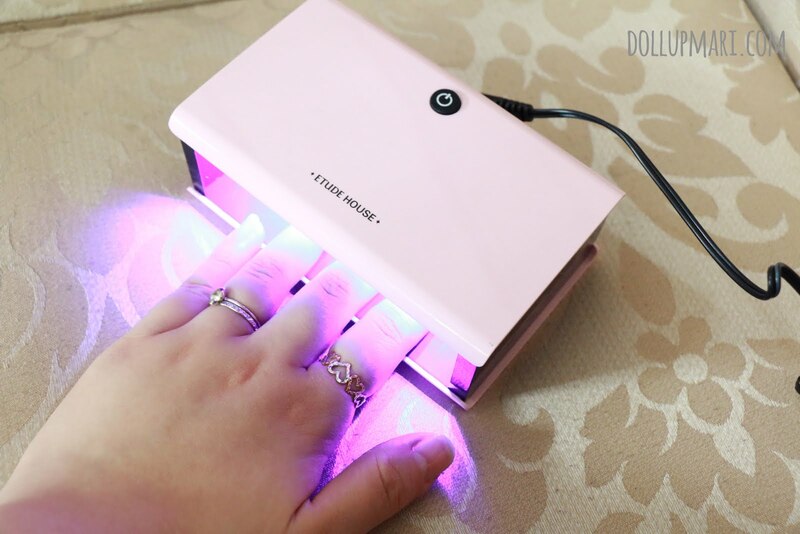 The system also eliminates the need to work carefully hours, or a day after the manicure, because the curing is fast, and is final. As for the color, I really like this shade. 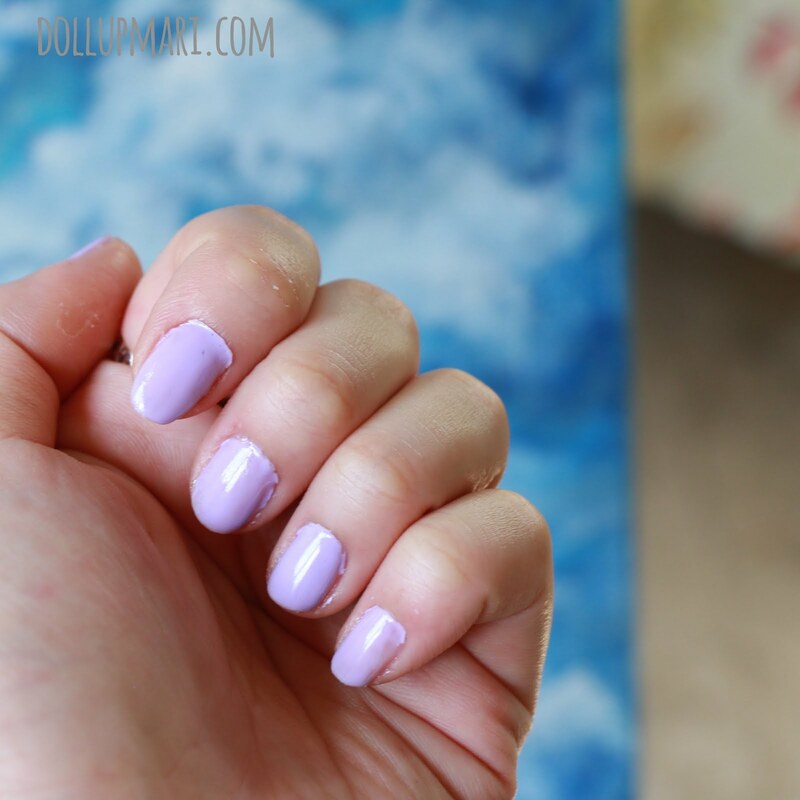 It's a flattering light purple that will suit most skintones. In general, too, I'm not very fond of very loud nail polish colors, so colors like these really appeal to me.